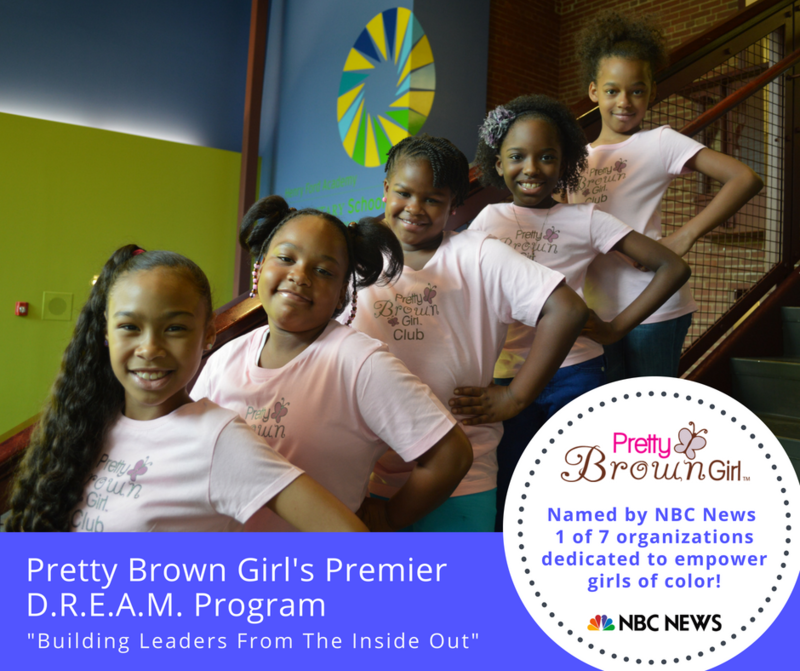 Ranked by NBC News as one of the top seven organizations dedicated to empowering girls, Pretty Brown Girl’s Revolutionary K-12 D.R.E.A.M. Program was designed to build leaders from the inside out, while guiding girls through a self-discovery journey that inspires confidence, self-love and a passion to pursue their dreams. Pretty Brown Girl’s mission is to educate girls of color and encourage self acceptance by cultivating social, emotional and intellectual well being. We offer three distinct Grade Bands for schools (Elementary, Middle & High School). Our approach is to provide an engaging platform for the subtext that most girls of color live within throughout their lives. This subtext often effects their world view, careers, life choices and relationships with others as they mature into adults. Our goal is to broaden the circle of conversation with girls to encourage healthy interactive dialogue and activities in a celebratory environment. For more information and to receive 2018-2019 school pricing, call us at 1-800-514-8559 or complete the interest form below! Please note: Program Facilitators must be official members of the school’s staff. Parents and volunteers can not facilitate the program. Rather than becoming a competitor to the wonderful organizations that focus on empowering girls, Pretty Brown Girl Curriculums foster partnership through which existing institutions can implement a reputable platform and join a conversation that touches so many girls and women in this country. A celebratory spirit is the essence of the Pretty Brown Girl Brand. Each program seeks to acknowledge what it is like to be a brown girl or woman and address the fact the skin tone is still a point of contention, while celebrating girls in a way that is both constructive and fun. The Pretty Brown Girl D.R.E.A.M. Program honors young ladies in different ages and stages in life by allowing them a safe space to have their voices heard. Donna Mims, Teacher at Metacomet School in Bloomfield, CT, has partnered with the Pretty Brown Girl Movement for 3 years and delivers a very special message!